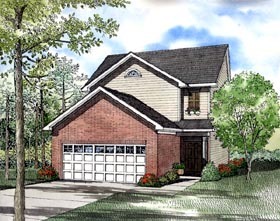 This plan has designed this two-story home with consideration for a growing family. The main level contains all family areas, which flow together to create a wonderful family environment. The Kitchen opens the Dining Room and has a handy island for extra counter space as well as additional seating. The foyer has a convenient half bath near the stairs, that lead up to all three bedrooms including the Master Suite. A space saver laundry area is located in the Master Suite bathroom.